When it comes to communications between machines, the terms Machine to Machine (M2M) and the Internet of Things (IoT) are seemingly similar to each other. In fact, there is a very strong connection between both terms, which is why, they are often used as the same. However, that is a mistake because there are substantial differences that need to be understood in order to separate each of them to their appropriate place. However, buzzwords can sometimes lead to confusion and cause questions to arise. We all are acquainted with the new IT buzzword – IoT. Every big and small tech company is betting on this innovation and rightly so. But unless you are a tech enthusiast, chances are that you wouldn’t know much about the predecessor to IoT – M2M Solutions. M2M solutions contain a linear communication channel between various machines that enables them to form a work cycle. It’s more of a cause and effect relation where one action triggers the other machinery into activity. M2M is a broad label that can be used to describe any technology that enables networked devices to exchange information and perform actions without the manual assistance of humans. M2M communication is often used for remote monitoring. Key components of an M2M system include sensors, RFID, a Wi-Fi or cellular communications link and autonomic computing software programmed to help a networked device interpret data and make decisions. The most well-known type of M2M communication is telemetry, which has been used since the early part of the last century to transmit operational data. Pioneers in telemetrics first used telephone lines – and later, on radio waves – to transmit performance measurements gathered from monitoring instruments in remote locations. Products built with M2M communication capabilities are often marketed to end users as being “smart”. In simple terms, IoT can be defined as a system where multiple devices communicate with each other through sensors and digital connectivity. They talk to each other, work in tandem, and form a combined network of services. The IoT allows objects to be sensed or controlled remotely across existing network infrastructure, creating opportunities for more direct integration of the physical world into computer-based systems, and resulting in improved efficiency, accuracy and economic benefit in addition to reduced human intervention. IoT has evolved from the convergence of wireless technologies, micro-electromechanical systems (MEMS), microservices and the internet. The convergence has helped tear down the silo walls between operational technology (OT) and information technology (IT), allowing unstructured machine-generated data to be analyzed for insights that will drive improvements. Are the IoT and M2M the same thing? What is the difference between them? Some experts define M2M as a subset of IoT, while others like to call Internet of things as an evolved version of machine to machine. Either way, the take-away is that IoT is a broader term than M2M solutions as it encompasses much more technology and connectivity. While both technologies work on the principle of connecting devices to work together, their connectivity scopes are different. M2M solutions rely primarily on conventional connection tools like wifi while IoT adds more sophisticated sensors into the mix. As a result, IoT based systems have much more flexible and varied connectivity options. There is also a clear difference in the applications of these technologies. M2M solutions, because of their limited scope, are confined to creating a network of machines that work in synchronization. On the other hand, IoT creates 360° solutions that allow for flexible responses and multi-level communication. Lastly, the key advantage IoT has over M2M solutions is the ability to add interactivity amongst devices. Machine to machine solutions operate by triggering responses based on an action. It’s mainly a one-way communication. In IoT based systems, communication to and fro flows freely. There can be countless scenarios and combinations. Although IoT is a more complete and modern solution, M2M still has its place and applications. M2M collaboration is a reliable and trusted solution for manufacturing setups in many industries, and will continue to serve this role for years to come. So, while IoT gets all the limelight, M2M will continue to serve as an unsung yet important worker within the industry. IoT already affects home appliance connectivity through platforms like Nest. 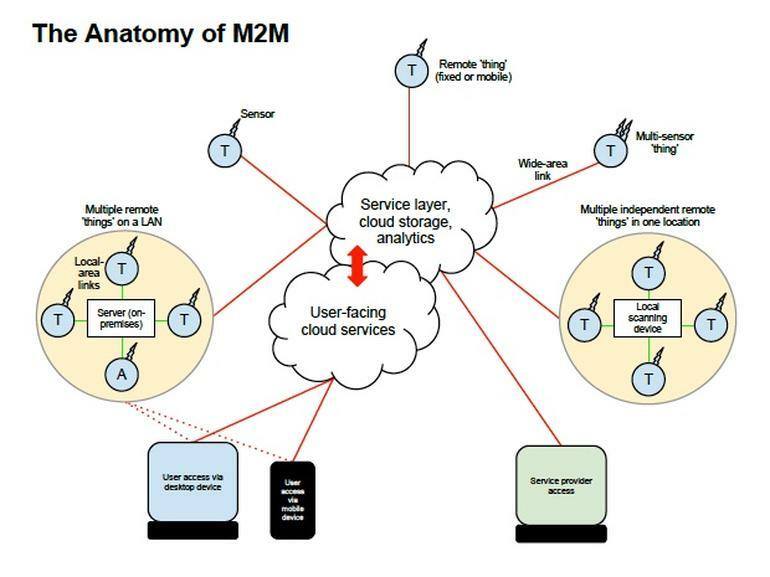 However, M2M is expected to take home-based IoT to the next level. Manufacturers like LG and Samsung are already slowly unveiling smart home appliances to help ensure a higher quality of life for occupants. For example, an M2M-capable washing machine could send alerts to the owners’ smart devices once it finishes washing or drying, and a smart refrigerator could automatically order groceries from Amazon once its inventory is depleted. There are many more examples of home automation that can potentially improve quality of life for residents, including systems that allow members of the household to remotely control HVAC systems using their mobile devices. In situations where a homeowner decides to leave work early, he or she could contact the home heating system before leaving work to make sure the temperature at home will be comfortable upon arrival. One of the biggest opportunities for M2M technology is in the realm of health care. With M2M technology, hospitals can automate processes to ensure the highest levels of treatment. Using devices that can react faster than a human healthcare professional in an emergency situation make this possible. For instance, when a patient’s vital signs drop below normal, an M2M-connected life support device could automatically administer oxygen and additional care until a healthcare professional arrives on the scene. M2M also allows patients to be monitored in their own homes instead of in hospitals or care centers. For example, devices that track a frail or elderly person’s normal movements can detect when he or she has had a fall and alert a healthcare worker to the situation. Every manufacturing environment—whether it’s food processing or general product manufacturing—relies on technology to ensure costs are managed properly and processes are executed efficiently. Automating manufacturing processes within such a fast-paced environment is expected to improve processes even more. In the manufacturing world, this could involve highly automated equipment maintenance and safety procedures. For example, M2M tools allow business owners to be alerted on their smartphones when an important piece of equipment needs servicing, so they can address issues as quickly as they arise. Sophisticated networks of sensors connected to the Internet could even order replacement parts automatically. Smart meters for electricity, gas and water, and the smart grids they create, form a major component of the M2M market. Real-time data on resource consumption down to the household level allows utilities to manage demand and detect problems efficiently, while householders can save money by optimizing their usage patterns. Smart agriculture is a growing field (as it were), with M2M technology available to track the location and condition of livestock, monitor the growing conditions of crops, and optimize the performance of farm equipment (using precise geolocation to minimize wastage in crop-spraying operations, for example). These spheres are not the only one where we can see M2M attendance but also in Automotive & transport, Supply chain, Field service, Security & surveillance, Military an etc. So, personally I agree with the statement that these two terms M2M and IoT are things of the future that has already came! Moreover, it is an evidence that the term IoT, that became mainstream, has been intertwined with M2M. Are you agree with it? In your opinion what are the key differences between these two services? Share with me your thoughts. I will be happy to discuss it in comments.